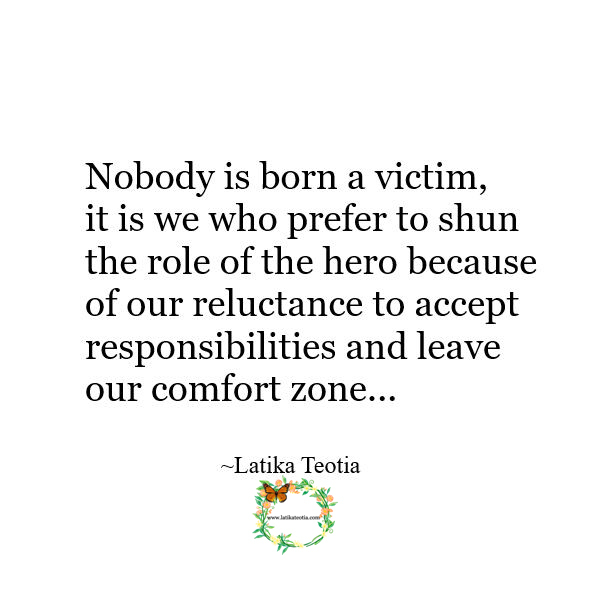 Choose the role of the hero instead of playing the victim card !!! Nobody is born a victim, it’s we who, over a period of time, succumb to situations and choose instead to play the victim because we find it easier. It suits us to carry the victim tag because we don’t want to come out of our comfort zone by taking on responsibilities. This, however, does not include those for whom life has been unfair by heaping impossible situations- my heart goes out to them and hope that God showers His mercies on them; may their troubles become small. My request is to those who are in a position to make a difference; they should choose the role of the hero instead of playing the victim card. Don’t be afraid of difficulties, hardships and unfair situations. Tackle them head on. God has blessed you with power use it and leave a mark.